Wulfe & Co. provides real estate services in Houston, Texas. Wulfe & Co. wanted a new modern look for their web site while retaining the existing functionality and content management system. We first refreshed their logo and then redesigned the Wulfe & Co. web site. We incorporated a wider screen profile, updated the web site with new colors and fonts for a cleaner layout and designed a flash banner for the home page that highlights their core services. We integrated our Email Marketing service into their website, building their contact database. We designed several custom branded email templates so their staff can easily send engaging email promotions to potential buyers and tenants. 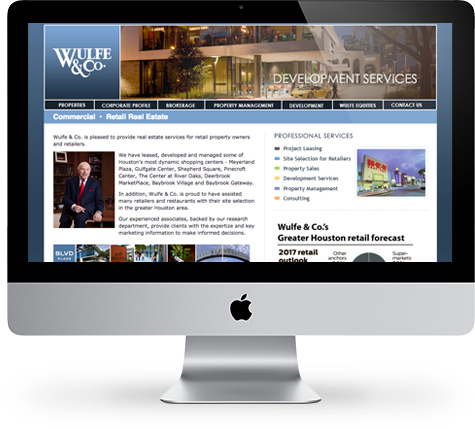 In addition to redesigning the website, Be Digital also designs outdoor signage, investor executive summaries, sales brochures and a variety of business identity collateral for Wulfe & Co.